Walt Disney once said, “A man should never neglect his family for business.” However, what if a woman spent her entire career attempting to honor her family? That is exactly what Sandi Vojta of Prairie Berry Winery in Hill City, South Dakota has done. She was the fifth generation wine maker when she joined her father Ralph in the commercial endeavor of making wine in the Midwest. She started by primarily making fruit wines from the “berries of the prairie” like her ancestors. Over the past ten years, Sandi has expanded not only her wine production but also the ways she honors her family in every aspect of her profession. Though Sandi has been using different Vitis Vinifera (traditional winemaking grapes) for several years in addition to the hybrid grape and fruit-based wines for which Prairie Berry is so well known, in 2012 she began production of the new line of Anna Pesa wines—a unique brand with a specific taste profile in mind, a taste that would honor Sandi’s goals and her family’s traditions. Anna Pesa was Sandi’s great-great-grandmother who immigrated to the Dakota Territory in 1876. Before coming to the United States, Anna lived in Moravia, Czechoslovakia, where she made wines using traditional grape varieties found in that country. Over one hundred years later, Sandi is using Riesling, Chardonnay, Zinfandel, and Cabernet to make a style of wine much like her Grandmother Anna would have. Because of South Dakota’s harsh winters and shorter growing seasons, most Vinifera grapes that Sandi’s grandmother would have had the ability to access don’t grow well here; hybrid grape species that didn’t even exist in the late 1800s weather the Midwest conditions best, so Sandi had to leave the state of South Dakota to source the grape varieties similar to what Anna might have fermented. Much like Anna did, Sandi sought the best fruit possible to create the style of wine the Prairie Berry winemaker envisioned. Sourced along the West Coast, Sandi has long-term contracts with many growers that she has worked with for several harvests already. Because she is a South Dakota wine maker, her concern in choosing fruit is not about expressing the terroir of where the fruit was originally grown; instead she wants to express a specific style of wine after production—a style she believes her grandmother would have appreciated. Cultivating relationships with the growers is the first step in the process of making these wines for which Sandi proudly exclaims Prairie Berry has “pulled out all of the stops” to produce. Getting the fruit is definitely a long-term, committed relationship, as it takes a year for growers to nurture the grapes to harvest before Sandi and crew then spend up to two years turning the fruit into wines that they hope leave a lasting impression on consumers. Having multiple sources of fruit is actually a benefit Sandi has that many winemakers don’t. She is not “putting her eggs in one basket” if one growing area has a vintage that doesn’t meet Sandi’s standards. Though these grapes grow thousands of miles away, Sandi works with farmers at every step of the way. She has input into choosing the yield (amount of grapes) per vine, pruning of the vines, thinning of the shoots, and even managing the canopy of leaves (covering the fruit). These specific growing techniques lead to grapes with the particular sugar and acid content that Sandi wants for the style of drink honoring her grandmother’s wines from the old country. Modern technology and shipping systems have also made cross-county grape growing easier for the South Dakota businesswoman, as juice samples can be sent to her at any time. After the fruit arrives at the winery outside of Hill City, Sandi begins the painstaking work of creating these labor-intensive wines. The recent production expansion at Prairie Berry was finished specifically for Anna Pesa wines. They are handled and fermented in smaller lots; then these two, three, or four smaller batches are blended to achieve the style and complexity of Sandi’s vision. The wines receive old-fashioned production treatments from beginning to end: battonage, stirring the lees (dead yeast cells) into the wine; delestage, racking the wine from one vessel to another; and punching down, stirring the cap of seeds, stems, and skins back into the wine. Though these practices are very hands-on and time consuming, they enhance the structure, mouthfeel, complexity, aroma, and flavor of wines. The additional production space has also allowed room to age these wines with barrels from different cooperages (barrel makers); the differences in oak also adds to the complexity of the final blended wine. Sandi’s work with and passion about wine has definitely paid off in the end product that meet her stylistic goals, her family commitment, and her grandmother’s memory. Anna Pesa 2013 Riesling: Listed as a semi-dry Riesling, this is a Riesling for those who believe Riesling is just a juice for novice drinkers of sweet wines. This serious Riesling will renew faith in the grape. On the nose, it smells of the traditional slight petrol, stone, and apple aromas. On the palate the green apple and acid with minimal sweetness make it reminiscent of dry styles from Germany or New York State—some of my favorites! So unique yet so Riesling, it would be a wonderful food-pairing wine. This is a wine worth buying on multiple occasions. 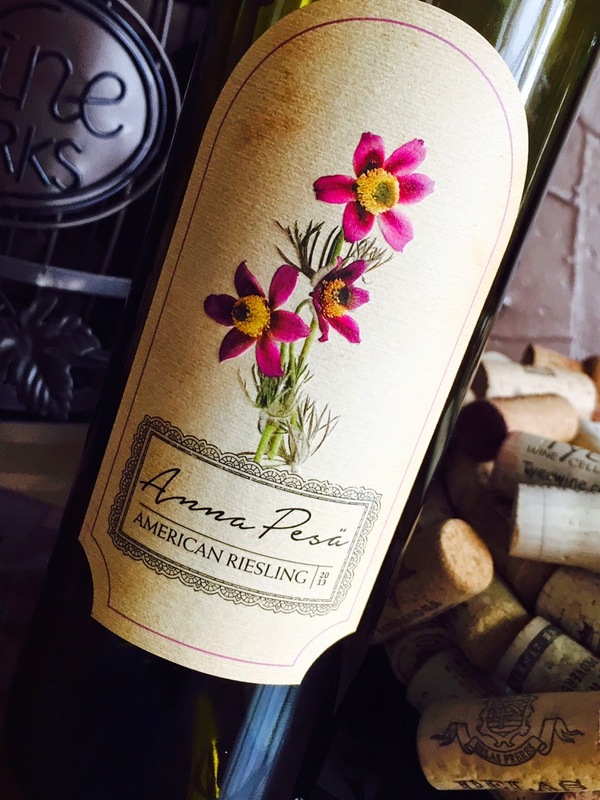 Anna Pesa Riesling--a serious, dry Riesling. 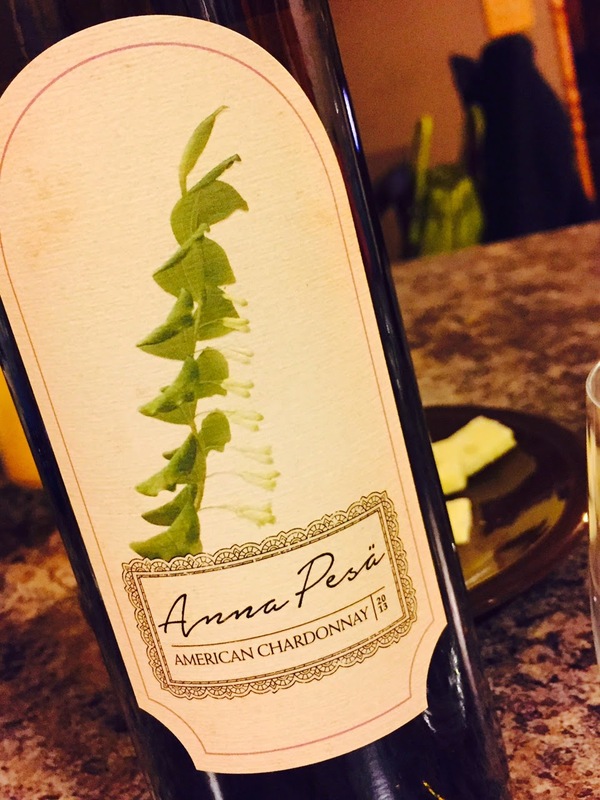 Anna Pesa 2013 Chardonnay: I enlisted my Chardonnay-loving friend to give me a more objective stance since Chard is not necessarily my favorite grape. However, this is also an old-world style wine. Buttery herbs are on the nose, yet the palate is very surprising with zippy acid and golden-delicious apple flavors. Not an over-oaked California type and so much more complex all the way to the finish. A Chardonnay that I didn’t need any help assessing—and my Chardonnay-loving friend gave rave reviews too! Anna Pesa Chardonnay--a Chard for those looking to escape the butter bomb style. 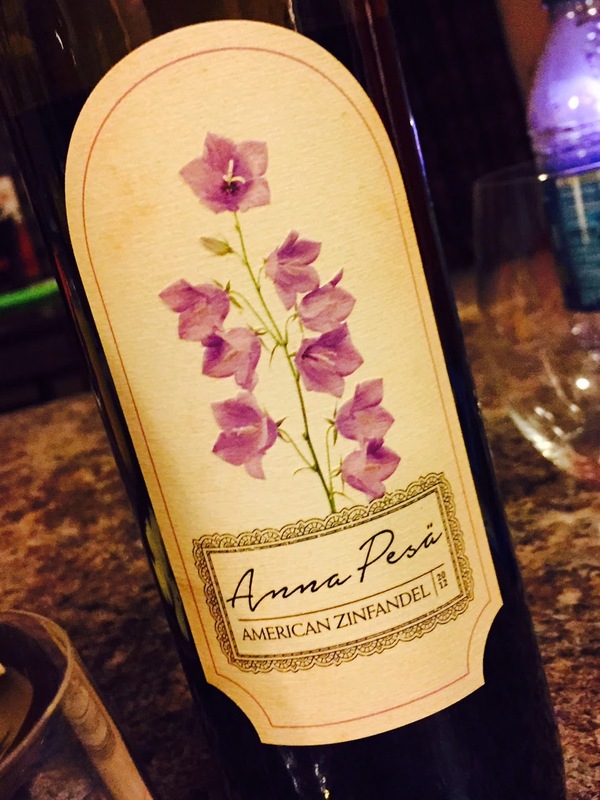 Anna Pesa 2012 Zinfandel: Aged a year longer than the Anna Pesa whites, the Zinfandel was very spicy on the nose, with black pepper, dried herb, mushroom, and earth coming through. A beautiful, deep garnet color, the spice carried through on the palate with great tannins. No big, over-ripe Zin sweetness comes through, so if a big California wine is the expectation, that is not what will be experienced with this wine. This has a light berry essence that is more pronounced on the finish. Good balance between the tannin, acid, and fruit. Anna Pesa Zinfandel--a more restrained, spicy Zin. 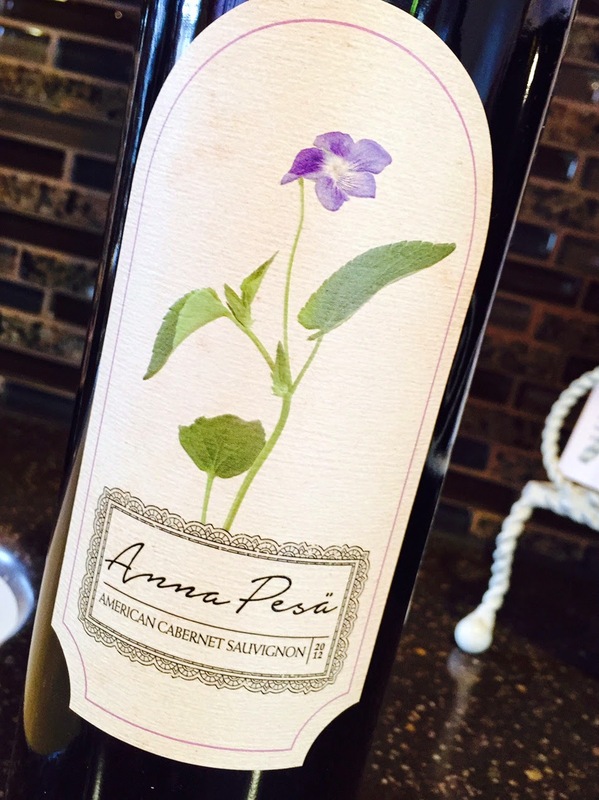 Anna Pesa 2012 Cabernet: Ruby red, chokecherry in color, this wine is a more robust wine than the Zin but definitely more restrained than a bold California Cab. Dried sage and boysenberry on the nose, its fruit is the first taste on the palate. Then the strawberry and blueberry mellow out through even tannins to a slight white pepper on the finish. It would be one of the easiest Cabernet Sauvignons to pair food with because of the balance between tannin and fruit. When I first tried this line of wines, I liked the more reserved Zin better than the Cab. This time, on the second tasting, I liked the more fruit-forward Cab. This shows my appreciation of both wines. Anna Pesa Cabernet Sauvignon--the most robust of the Anna Pesa line, yet still old world style restraint. Though the first vintage has only been released a few weeks, future vintages are already in the works, including these same four varietals in addition to a 2014 Anna Pesa Chenin Blanc currently fermenting. In further attempts to emulate Grandmother Anna, Sandi would love to source a traditional Moravian grape like Blaufrankish to make a wine. However, these varieties are very obscure and hard to find in this country since few Americans have heard of or tried this grape as a single varietal. Even if she could find Blaufrankish grapes, Sandi would have to get special TTB approval to bottle it as a Blaufrankish (as it would have been called in Moravia) and not a Lemburger. Then she would need to convert Merlot drinkers to Blaufrankish wine! Sandi has paid tribute to her family with every step over the past two years as she has loved these wines into the bottle. Sip after sip, the old-world influence of these wines came through. When drinking the end product, it is evident that European wine making was the inspiration, even if the grapes came from the U.S. West Coast. Sandi Vojta has spent over a decade doing a great job of mixing family and business. As the fifth generation to make wine, she has worked to honor her ancestry while meeting her own stylistic goals. Her newest wines not only pay tribute to her great-great grandmother, they are reminiscent of an old-world style that make her Czechoslovakian roots very proud. Anna Pesa and her other descendants are smiling down on Sandi…probably with a glass of Moravian wine in hand.